It’s hot out there, Kolkata. If you’re looking to chill out and refuel on caffeine, we’re hard-pressed to think of a better drink that’ll do the trick than a tall cold coffee. From globetrotting coffee riffs to beloved local staples, these are the ones you should hit up. Along with giving us a picture-perfect café to lounge in, Artsy has started serving the perfect summer fix. Priced at INR 200, the coffee tonic is as simple as it sounds, an espresso shot mixed with tonic water. The bitterness of the coffee goes perfectly with the fizzy and lemon flavoured tonic water. For all of you who don’t like heavy coffee drinks, the chilled coffee tonic is the perfect beverage for you. You will keep going back for more! Artsy offers several kinds of icy cold coffees – from Vietnamese Iced Coffee (INR 150) and cold coffee with ice cream (perfect if you have a sweet tooth) to cold brews for those of you who like strong black coffee. One of our fave cafes, 8th Day’s nitro coffee (INR 179) goes through a long 24-hour complex procedure before it is served tall black and without any sugar. Pair it with their sinful cookies for just the right start to the day! Or with break-up brownies for blue days. If strong coffee isn’t your style, try their handcrafted brew – dark and simple (INR 129) or light and sweet (INR 159). Can’t get enough of sweet? You will love their mocha frappe (INR 199). This hidden gem in Gorkee Sadan has concocted a summer drink which we can’t get enough of. The perfect blend of brewed tea with coffee with just the right amount of mint. Not a huge coffee fan. That’s not a problem you will still like this beverage. Priced at INR 190, the mint iced tea coffee is the drink you would want to sip on after a long day. You must try their Vietnamese Coffee which has slight cinnamon flavour, pair it with their cookies or choose from their wide range of food options! This Feluda-themed café will answer your coffee payers. Try the affogato here, an espresso shot with a delicious dollop of vanilla ice cream – the perfect combination of strong and sweet. (INR 120) If an affogato is not what you prefer, try their Café Ghurghutia or their Tiramisu Cold Coffee for a sweeter twist. Frozen coffee served with condensed milk, sounds like a summer dream, right? Head to Terminal_11, for their Coffee On The Rocks (INR 110). The taste does not get diluted, in fact, it gets stronger as the coffee melts with the condensed milk. If you are not feeling too adventurous you could try their freshly brewed Café Toffee (INR 225) which is an absolute crowd pleaser. Our go-to place for any Korean food, Kings Bakery has a great blend of cold coffees too (the owner is a trained barista after all). 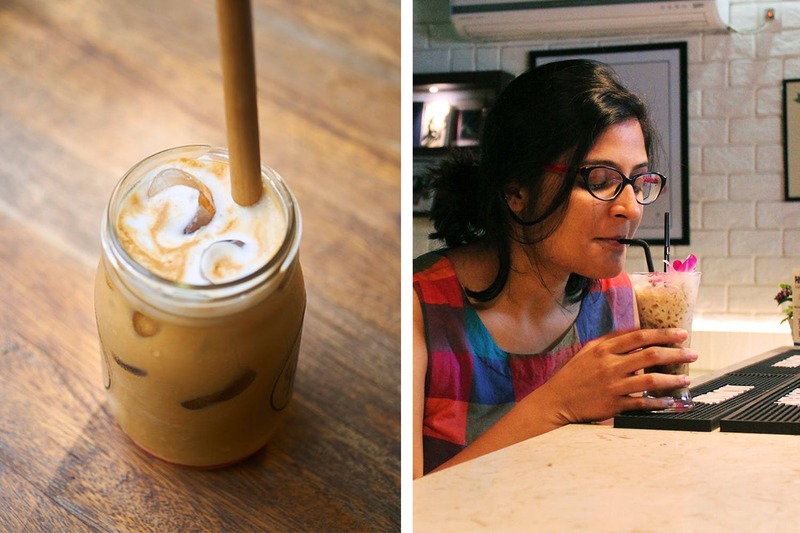 Their Korean Iced Coffee (INR 150) is a must try. With sugar and milk, it is not very strong and something that everyone will enjoy. Their caramel macchiato is hard to miss, sip on it with bites from their doughnuts from the complete experience. If something stronger is what you are looking for, go ahead and try their cold brew without milk and sugar. Popular for their season variations, this summer Starbucks has launched a great coffee drink, the Midnight Mocha Frappuccino (INR 250). With java chips and whipped cream topping, this decadent beverage is rich and creamy. A few extra calories after a long day of work don’t really count, do they? You could also try their cold brews which go through an extensive process. In case you ever wondered how they make their coffee, the baristas would be more than happy to show you. Some things never change and it is better that way. Sip a simple cold coffee at the iconic Indian Coffee House, hum Manna Dey’s ditty – just for the nostalgia factor. It is a Kolkata legend, and was around much before Barista and Starbucks came along. The likes of eminent personalities like Rabindranath Tagore and Netaji Subhash Chandra Bose have had coffee here. You could try their simple cold coffee (INR 35) or add some cream to it at INR 5 and sip on it while having a great conversation with a friend.